Happy Valentine’s Day tomorrow! My husband and I officially have no plans, no babysitters, no dates, and I have no presents (and the likelihood of him having anything is not good), but we do have lots of candy, so we might be able to salvage the day. So when I was growing up, my dad would always make scones for our neighborhood 4th of July party and for super special occasions. And by scones, I mean fried pieces of sweet bread dough that we would douse in honey or dust with powdered sugar. One night when I was in middle school, it was pronounced that we had scones in the house and I was simultaneously puzzled and thrilled because scones were strictly a holidays-only affair. Imagine my horror when I discovered that these scones resembled triangular biscuits. HORROR. And then I tasted one and all was forgiven. Sweet but not too sweet, melt-in-your mouth texture, flaky, buttery, and crumbly in the best possible way. Call me weird, but I think scones are totally romantic food. If my husband made me scones, I would a) wonder who he was (especially since upon eating these scones for the first time, he said, “What are these supposed to be like?) and b) I would let him pick our next date night, which would probably involve The Phantom Menace in 3D and no talk of scones. Sara has a fabulous basic scone recipe, but constantly feeling the urge to wander culinarily (I’m 98% sure that’s not a word), I adapted this recipe from Allrecipes and it comes from Pam Anderson at Three Many Cooks. First, place the oven rack on the lower-middle position (unless your oven bakes hot like mine does or not hot, like mine doesn’t–then use your pretty brain to figure out where it should go. Mine needs to go in the middle). You’ll need 2 cups of flour, lightly spooned into measuring cups and leveled with a knife, sugar, baking soda, baking powder, salt, frozen butter, sour cream, an egg, lemon zest, and poppy seeds. 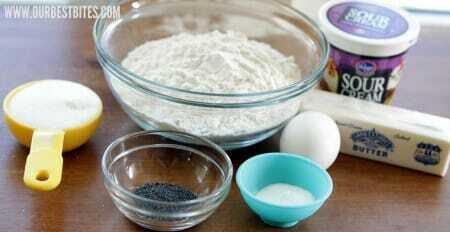 In a medium bowl, whisk together the flour, sugar, baking soda, baking powder, salt, and poppy seeds. Add in the zest of 1 lemon and whisk again. Grate the frozen butter (a food processor will make the job even easier!) Take a picture because I have determined that grated butter is one of the prettiest, most photogenic things ever in the history of the universe. 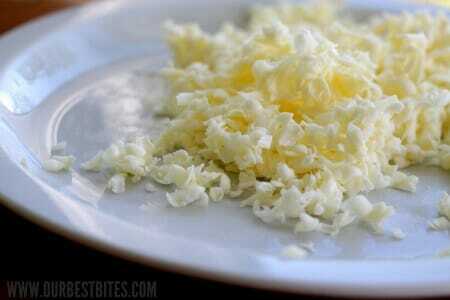 The fact that I find grated butter so pretty probably says something about me. Toss the grated butter into the flour mixture and use your fingers to combine the mixture so it appears like coarse meal. and then whisk it together until it’s smooth. Drizzle it over the flour mixture and then toss the mixture together with a fork, trying to ensure the flour mixture is evenly moistened with the egg/sour cream mixture. Use your hands to press the dough into a ball. It will come together slowly–some portions of the dough will be more moist than others, and it may seem like it’s too crumbly, but be gentle and consistent and it will all come together. I promise. There’s probably some cheesy life lesson in there somewhere. 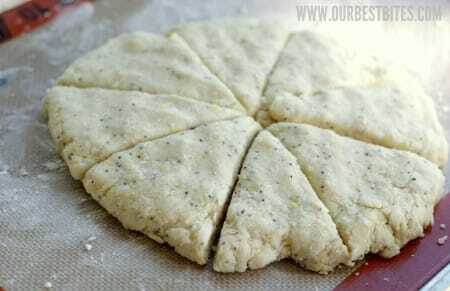 Use a butter knife to cut the dough into 8 equal triangles. Have I ever mentioned how very bad I am at geometry? Separate the triangles and evenly space them on a lined baking sheet. Bake until golden, or about 15-17 minutes. Remove from oven and allow to cool. While the scones are cooling, whisk together 1/4 cup strained lemon juice, 2 tablespoons melted butter, and 1 1/3 cup powdered sugar (more if you want a thicker glaze). Place the glaze in a Ziploc bag. If you want a thin glaze all over the whole scone, you can drizzle it over the scones while they’re still a bit warm. If you want the squiggles, wait until they’re completely cool. Personally? I would go for a bit warm, glaze dripping down the sides. Seriously…to die for. Preheat oven to 400. Place baking rack in the middle-low position. Line a baking sheet with parchment or a Silpat and set aside. 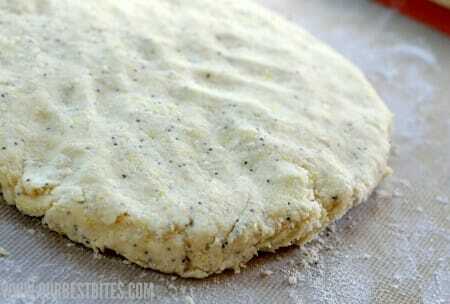 In a medium bowl, combine the flour, sugar, baking powder, baking soda, salt, and poppy seeds. Add the lemon zest and whisk together again. Grate the frozen butter (a food processor makes that job super easy, but you can also just do it on a regular box grater). 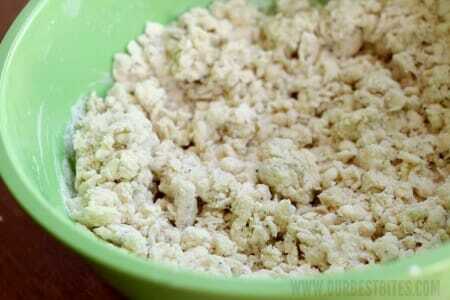 Toss the grated butter into the flour mixture and combine it with your fingers until it resembles coarse meal. Set aside. 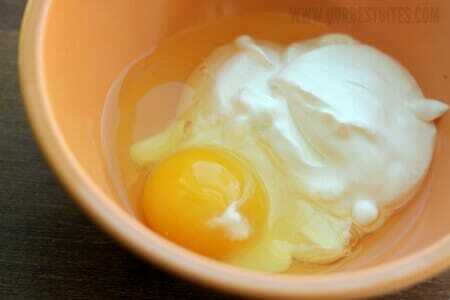 In a small bowl, whisk together the sour cream and egg. Drizzle it over the flour mixture and then toss the mixture together with a fork until everything appears moistened. Gently press the dough into a ball–it will take some time and some parts of the dough will be more moist than other parts, but continue pressing together until it forms a ball. Lightly flour a surface (you can use the lined baking sheet if you want) and place the dough on top of the floured surface. Press into an 8″ disc and cut into equal wedges with a butter knife. Separate the wedges and place them evenly on the baking sheet. Bake in the preheated oven for 15-17 minutes or until lightly golden. Remove from the oven and allow to cool. While the scones are cooling, whisk together the glaze ingredients until smooth. 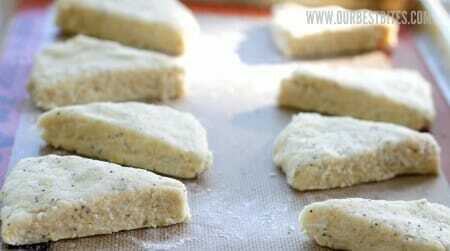 Place in a Ziploc bag and drizzle over the scones. You can do it while they’re still warm so it spreads over the top and sides of the scone (which I kind of love) or you can wait until they’re completely cool and drizzle squigglies over the scones. Makes 8 scones. Do you think the other kind of scone that you mentioned at the beginning has anything to do with either regional or cultural (aka Utah/Mormon)? I’ll take either kind, because these look awesome. And you did me a favor cutting your scones skiwhompas, so that when I do it too I can say, “Oh, I’m just like Kate!” and it won’t be a bad thing. Yum! I love scones! Both “regular” and “Utah”. I grew up with fried dough scones on holidays only (Dad’s family is from SLC). It wasn’t until about 2 years ago that I discovered that it wasn’t just my family that called fried dough scones when I read on another blog (Make It Do) that it was, in fact, a Utah thing. To make blueberry scones, do you just replace blueberries for the lemon and poppy? My husband and I have decayed the scone thing countless times. He’s from Utah and insists that the baked version is not a scone. We’ve even resorted to researching online! Anyway, these look delicious and will definitely make an appearance on my breakfast table soon. BTW, could I leave out the poppy seeds? Yes, you can totally leave out the poppy seeds. In fact, I’m pretty sure you could put just about anything in these and they would be incredible. I have a totally scone-ignorant question! I’ve never had one… Are they like hard cookie-ish consistency, or soft like cake?! They’re kind of like sweet biscuits. Does that help? I’m going to try these! 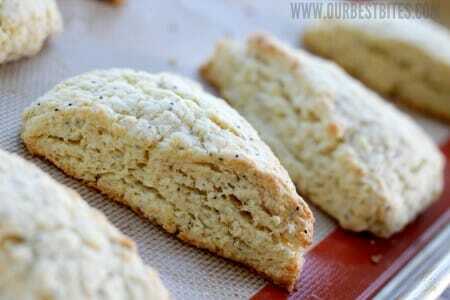 I was wanting a lemon poppy seed scone recipe, and you delivered! By the way, what you grew up thinking were scones are actually sopaipillas. I think it’s a Utah thing to call them scones. I grew up in Colorado and I remember being confused when I went away to BYU, wondering why people were calling sopaipillas “scones”. Oh, and I would totally use a pizza cutter rather than a butter knife to cut these apart. I found this basic recipe years ago and everyone goes nuts over them. I usually do plain with chocolate chips, orange/cranberry and ginger with cinnamon chips. The sour cream is the secret. I definitely will try lemon/poppy seed next time. Thanks! I LOVE your recipe for the Lemon Poppy seed scones, however my husband would prefer blueberry, can I take out the poppy seed’s and add blueberry’s Or Dried cherries?? Yep, totally! I’m not sure how many, but I really think you could add just about anything to this recipe. It reassures me that I’m not the only one who grew up thinking that scones were a sweet fry bread. While I grew up in WA, my mom was from UT, so I guess that explains it. OK Kate, you have convinced me to try this type of scone! Up till now I’ve had a strong loyalty to the fried kind and all their deliciousness; when I saw the baked version of scones I would think “why would anybody want to eat that?”. I had always thought they were hard like biscotti, but “sweet biscuit” sounds awesome! I so appreciate you and Sara’s posts for their ability to get me to try new things (although I probably would have been okay having never tried sweetened condensed milk, you two kind of unleashed a monster with that one). 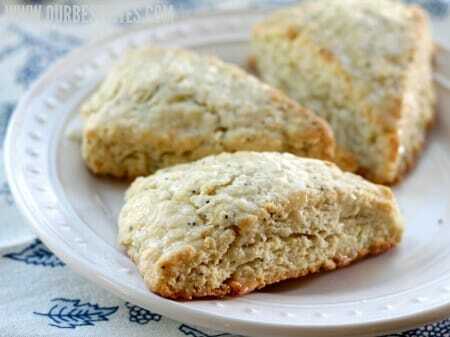 I love these kind of scones!! I make a pretty mean strawberry lemonaide scone (my own recipe) and a cranberry orange scone adapted from somewhere (I can’t remember). Anywhooo, I make my glaze in a shallow wide bowl and dip the tops of the scones in the glaze.. it covers the top completely, it is really quick and it leaves some glaze to run down the sides. Works perfect every time!! By the way, I have been watching your blog for over three years now, I do not usually leave comments, but I absolutely admire you two for doing what you have done! I love my kitchen and creating in it is a passion, thanks for helping keep that passion alive! @Angie: I was just thinking that as I was reading the recipe – I’ve got all the ingredients and I was trying to think of something to do with the lemons sitting on my kitchen table. I’m definitely going to dip mine! I love scones, although I am used to the fried kind. I love it with honey butter. My uncle ran a restaurant in the mall years ago. He also served scones with honey butter. The honey butter was made with Honey, Butter and MARSHMALLOW CREAM! It’s basically the most delicious thing I’ve ever tasted. I love Lemon and Poppy, so I’ll have to give this one a try. Since you have given ME so many fabulous suggestions, I just thought I’d share a little bit of joy with you for a change – you mentioned how pretty and photogenic the grated frozen butter is (I agree completely), and I just wanted to let you know that the Microplane grater grates CHEESE just like that! In sweet little curls – so you can have adorable cheese (yes, that’s gilding the lily a little, I know, but how ‘grate’ is that?) every time just by using the medium ribbon side of the super awesome box grater! And I’m normally not a big fan of box graters, but this one is fabulous – mostly because of the adorable curly mini-ribbons it makes out of cheese. These look DELICIOUS!! I absolutely love scones… I make a pretty mean chocolate chip version myself. 🙂 I will have to try these! I have everything in my pantry except full fat sour cream…..I have light sour cream. Do you think that would work? 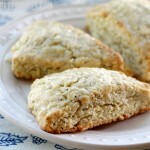 I *really* want to make these scones right now….lol! PS I have never heard of fried scones, but they sound so yummy! Rebecca, I always use low fat substitutes and don’t have any complaints, in fact a lot of compliments. You could also use plain greek yogurt, it would even be better for you and no fat! with lots of yumminess! Good Luck! What if you substituted Greek yogurt for the sour cream? I do it all the time in other recipes. I haven’t tried it, but I’m willing to bet it would work just fine! Let us know how it turns out! The Utah scones are indeed, fried bread, my grandmother always used to save bread dough for scones whenever she made bread. Now its Rhodes frozen bread dough for the lazy part of me….The sweet biscuit-like scones (pronounced with a short “o” vowel- “scons”)are from England. I love both!! Kate, these look super scrumptious! Great job! I’m with ya on the warm glaze. Thanks for sharing. Made these tonight, they turned out amazing! I have made my fair share of scones before but none ever called for an egg, so I was curious how they would turn out. Definitely not disappointed! I did the whole thing in the food processor; first pulsed all the dry ingredients together to combine, then added the butter (I just diced mine right out of the fridge, didn’t bother freezing or grating it), then the wet ingredients. I also added the juice of half a lemon right to the batter. It came together really fast and easy and I had no trouble getting it to form into a disk. Can’t wait to experiment with other flavors using this recipe as a base; I have made oatmeal scones by replacing half the flour of my standard scone recipe with oatmeal, which I might try with this recipe sometime. 🙂 Thanks for sharing. I just made these this morning. They are wonderful!!!! Not too sweet so perfect for morning! Thank you!! So I went to make these this morning, and then realized my sour cream had been left on the counter all night. So I substituted it with the only ingredients I had that were somewhat similar. I thinned out some cream cheese with milk. The scones actually turned out delicious and looked just like the picture! Haha! Sweet! Thanks for the recipe! Oh my, these are like heaven! Thank you!! Made these this morning and they are wonderful, tasty and so pretty!! I had a bit of a challenge with the butter but managed just fine. Loved that my kitchen smelled like fresh lemon. I think I’ll try doing 2-4″ rounds and making 16 smaller scones. I didn’t have my glaze ready when they were fresh out of the oven so I definitely will do that next time so they look more like a glaze (mine turned out like a frosting) and put on when the scones are warm. So I want to try blueberry scones next…yum! I made a coconut lime version of these. THey were A-M-A-Zing!!! I used lime zest in place of lemon and 1/3 cup toasted coconut in place of poppy seeds. I also added a little untoasted coconut on top before baking. Then I juiced the lime and added powdered sugar to drizzling consistency for the glaze. Awesome awesome awesome. I juat made these and they are superb! I didn’t have lemon, so used orange zest and orange juice for the glaze. It is super hot here in Gridley, so my frozen butter didn’t grate, just blobbed. I used a pastry cutter and it was fine. The coconut lime version above sounds fantastic. Love this blog! Have you ever considered placing your unbaked scones on the baking sheet close together? They come out amazingly perfect…no rough edges and soooo tender all the way through! Learned this from a farmers market this weekend! Let me know what you think! Made these last week! Chucked in some coconut instead of poppy seeds ( as didn’t have any) and they were fab! Now a craving I get fortnightly. You can substitute anything – really the sky’s the limit. I’ve made blueberry/lemon, orange craisin, cherry/almond, lemon poppy, cinnamon/raisin, chocolate chip, and 1 with white chocolate. So get your imagination working!!! I don’t measure the “add-ins”; whatever looks right to you is right!!! Bon Apetit! If I put this dough in the fridge overnight, would it still cook up OK? I want to make these for my mom for Mothers’ Day breakfast, but, you see, we have 9 o’clock church, which makes it difficult. It should be a crime to have something taste so good! We subbed Greek yogurt for the sour cream because that is what we had. We also had to add a bit more than it called for but they were tender and so delicious! You have the most gorgeous way of displaying each sweetie and your recipes make it easy for a poor old cook like me to follow every instruction without worry and I hope you will let me subscribe to your beautiful Bakery. Every other bakery I used for a recipe, gave me half of the recipe and then insisted I join or I could not have the rest of the recipe. I was just asked to leave a lovely bakery because they came back and said my email was phony. I’ve had the same email for 21 years but I had to leave. You lovely kind people let me take my time writing each recipe and I’m going to tell all of my Baker Friends where they should go for outstanding recipes and delightful people. Thank you so much and I wish you continued success. Sincerely..Sandy Malcolm. Just made these after seeing the recipe a few days ago and craaaaving them! They turned out great! I got a lot more than eight too, more like 14 which is kind of nice! They are delicious! and I have never grated butter before- that is awesome. and looks like shiny curly shredded mozzarella. (hmm…that substitution may be a funny april fools joke…) Loved this recipe!